Loquats, 'Eriobotrya japonica,' are documented to have been grown in Japan around 1100 AD. Some botanists have suggested that the first plantings of the loquat trees may have come from China originally and later were introduced into Japan. The loquat tree was widely distributed in Europe after 1712, but early records show that it came to the United States in the mid-1800's. This prolific plant is now established firmly as a seed-borne naturalized fruit tree in hundreds of countries, even in the Southern United States, where it readily grows after the seed sprout from bird-planted visitations after eating the loquat fruit directly from the trees. Loquat fruit in the South is most commonly known as the "Japanese Plum," but in Texas its less common name is the "Chinese Plum." The loquat tree when mature can grow 35 feet tall; however, the soft wood in the limbs and trunk will self-prune the tree to lower heights after experiencing the heavy weight of huge fruit crops. Most plant parts of the loquat tree are covered with fuzzy little hairs except on the trunk of the tree, where they are replaced by smooth bark. The loquat fruit itself is covered with these fuzzy little hairs much like the fuzz on the skin of a peach. 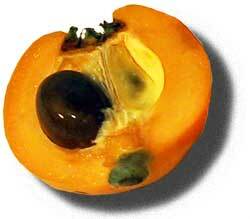 The fruit of the loquat is bright yellow on the skin and the pulp on the inside. Some rare cultivars originating from Japan may develop an orange skin and a white pulp. Inside the pulp is a 2-3 cluster of large brown seeds that are easily removed from the edible, interior, tasty layers of the loquat. The fruit size of loquats is 2 � inches or less and the shape and taste is similar to that of a kumquat fruit, perhaps a little less acidic and sweeter than a mature kumquat. The delicious, juicy taste of the loquat fruit rivals any common fruit, and preserved jams is a treat to be remembered when eaten on hot buttered toast. Because of the fuzzy skin surrounding the loquat fruit, many gardeners prefer to peel off the fuzz before eating fresh or before preserving to use in pies or gourmet dishes. The leaves of a mature loquat tree vary considerably in size, usually ranging from six to twelve inches in length and the dark-green waxy leaves are prominently bisected with recessed leaf veins. In the fall around Thanksgiving holidays, the loquat tree loads itself with clusters of one inch white flowers, which are extremely fragrant and especially pleasing when trees are planted near patio entertainment centers. The loquat fruit can begin to ripen in South Georgia as early as February and March and in an extended ripening period, depending on the weather, the loquat may continue to ripen into June. The loquat has been designated on some websites as only capable of producing fruit in areas south of Jacksonville, Florida, but this is incorrect. Loquats produce fruit reliably every year throughout Southern Georgia and coastal areas up to North Carolina. The loquat trees have survived low temperatures of zero degrees Fahrenheit in Georgia, and have returned to fruit later. The roots of a loquat tree are shallow and the soft tissue grows rapidly to establish a vigorous system. Although the ripening time of loquat fruit is not always predictable, the fruit is grown all over Europe, because of low production costs, the delicious flavor and the early time of ripening that causes the loquat to sell at premium prices--being available for markets before most other fruits. In Europe the loquats are sold at roadside markets and popularly sold in paper cones on the Isle of Capri, just off the coast of Italy. In the United States very little marketing activities are directed towards selling loquats to compete with other fruits, but some hybridizers are trying to develop cultivars with fruit having a large size, few seed, more pulp, sweet balance of flavor, and improved cold resistance. The fruits of loquat trees are loved not only by humans, but by wildlife, and dogs also love the fruit after it falls to the ground. Extensive tests have not been done on nutritional benefits of loquat fruit, but scanty chemical analysis has shown that the loquat contains substantial amounts of Vitamin A, Vitamin C, and minerals such as Calcium, Potassium, Phosphorus, and Iron. The fresh fruit medicates like a sedative and will stop uncontrollable vomiting or a manic thirst. For a tropical look the loquat works well in the landscape and form. The dense foliage provides an excellent block to street traffic or undesirable neighbors. The loquat tree can grow thirty-five feet tall, but usually a heavy load of fruit forces the tree to be self-pruned at around ten feet. The plant also makes a desirable, large tub specimen. The leaves are dark waxy-green with a woolly texture underneath. The large stiff leaves are about twelve inches long and three inches wide, much like magnolia leaves in appearance. Learn more about various trees by visiting the author's website: http://www.tytyga.com.